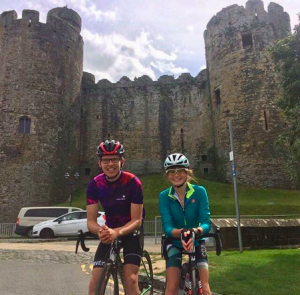 My name is Emily and I’m a cyclist, runner, and triathlete from the South West, UK. I have always loved sport for the competition and swam competitively throughout my childhood. In my early teens, I was introduced to running via schools cross country. It’s the PE lesson that most children dread but once I discovered that I wasn’t too bad I was hooked. Running became my way of exploring the local trails further and faster than walking while also feeding my competitive streak. At university, I jumped at the chance to join my two previous passions of swimming and running, leading me to start triathlon. This was where I found cycling and I never looked back. Cycling provides me with the chance to push for performance while enjoying the great outdoors. Over the few years I’ve spent on my bike, I’ve enjoyed the rapid progress in my fitness and confidence on the roads. 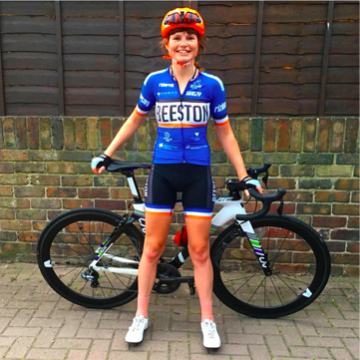 Improving my cycling has not only allowed me to partake in the booming women’s racing scene here in the UK but also gives me the confidence that no matter where I want to ride, no gradient nor distance can stop me. This time last year I took on my most epic adventure to date. After completing a 200-mile (320-kilometer) seaside trip with a small group of friends from the University of Nottingham cycling club, I was looking for my next adventure. After pouring over maps of South West and Wales, my partner in crime, Tom, and I settled on another 200-mile adventure. However, this time we were leaving the flat Midlands at home and venturing to the hills of Snowdonia. We arrived at our B&B on Friday night and were welcomed into the cozy farmhouse by our wonderful host for the weekend. Bryn Sion is a delightful little B&B just outside of Dinas Myfawdy. We settled in, locked up our bikes and headed to seek out dinner. Just a short drive away from Dinas Myfawdy, almost in Dollegaeu, is The Cross Foxes. The pub is tucked away at the foot of the Cadair Idris Mountain. With exceptional food, generous portions and welcoming staff, the slightly pricey menu is worth every penny. Over dinner we made the most of the excellent Wi-Fi (we soon discovered this is a rare occurrence in this part of Wales) and poured over the upcoming weather forecast. Saturday looked grim and after sampling some of the hills in the car we decided to dedicate an extra day to preparation and rest. As predicted, Saturday was a grey and drizzly day, but we didn’t let this dampen our spirits. 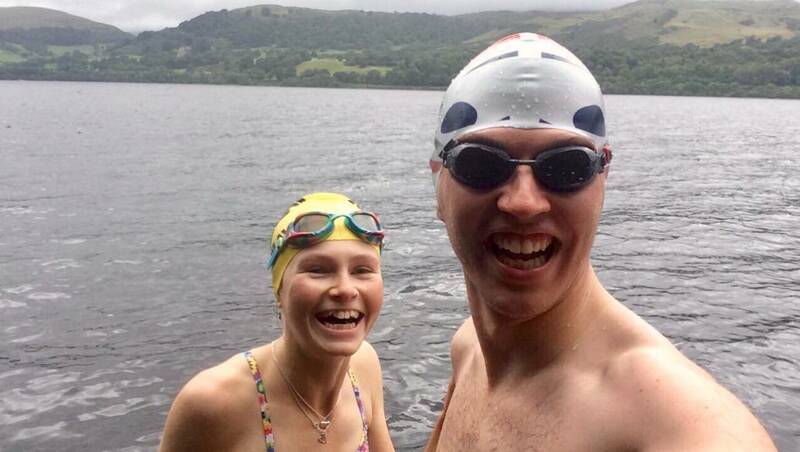 Instead, we embraced the wet weather fully and took a refreshing dip in Lake Bala. We spent the rest of the afternoon and evening adding the finishing touches to our planning in a local pub called The Red Lion, eating our way through the traditional pub menu and indulging in a few too many ales. After a short recovery walk back to the B&B we were soon tucked up in bed running through kit lists in our head and nervously awaiting the 4:30 am alarm. Starting early is one of the best parts of an adventure in my opinion. I will always be a morning person and there’s something very special about being the first person up and enjoying the great outdoors. The early start was aided by our fantastic host who insisted on getting up to make us breakfast and see us off. 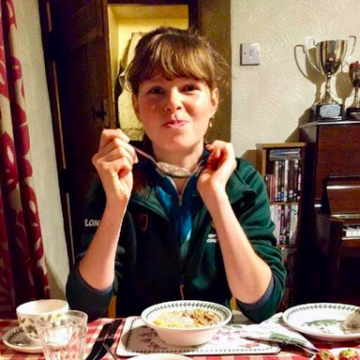 We were treated to the usual breakfast spread of cereals, fruit and toast along with steaming bowls of porridge on special request. After filling our bellies and checking the bikes over we were waved off into the deserted misty hills to begin our epic loop. One thing neither of us had considered or prepared for is just how cold Snowdonia can get at night. Despite being the middle of summer and temperatures reaching the 20’s during the day, the morning was painfully cold. The passing fields that we could make out through the mist were jeweled with a light frost. However, one of the perks of cycling is how quickly you warm up once you get moving, especially if you chuck in a few hills. Little did we know that just 3 miles (5 kilometers) down the road from the start we had popped in a pretty hefty first climb. 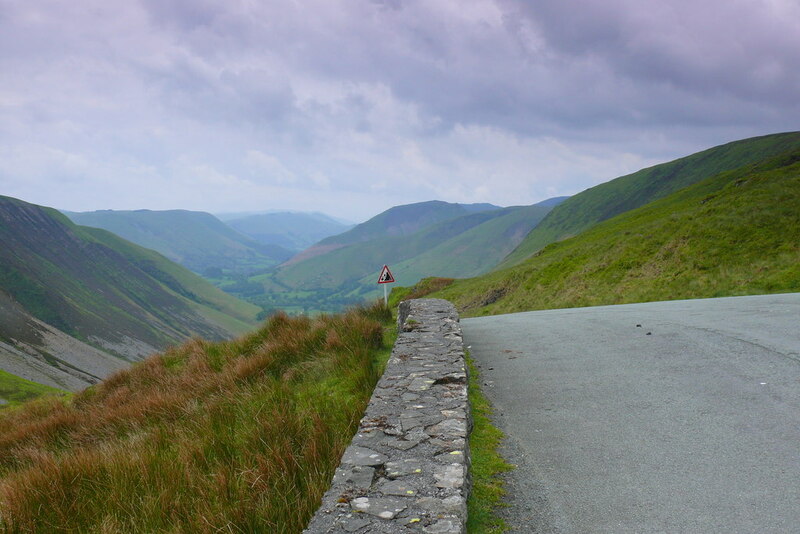 Bwlch Y Groes is the second highest public road mountain pass in Wales—and it certainly feels like it on two wheels. As we ground up the winding road, the fog cleared and our frozen toes soon felt toasty. The climb is long and steep with a relentless gradient up until the last inch. It is probably not for beginners or for the greedy cyclist who ate far too much breakfast not long ago. 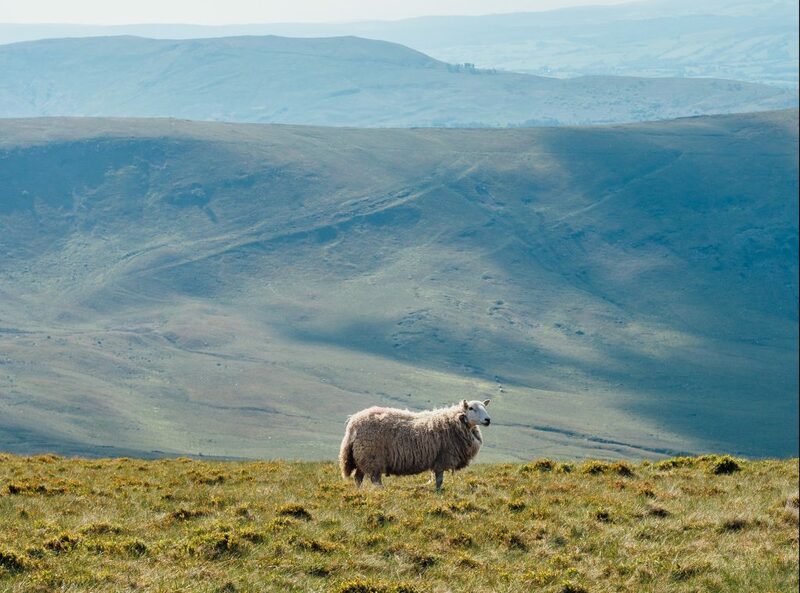 As we turned the final corner and could see the peak, still a long way up, the churning feeling in my stomach became too much for my determined legs. I unclipped and slowly hobbled my way up closely behind Tom, still peddling upwards. The view at the top is worth the burning quads (or calves if you are forced to hobble up like me) and the chance for a welcome photo stop as I let my breakfast resettle. Our stop was short but sweet in the knowledge that after that much elevation gain we had a few miles of descent to enjoy—down to the first lake loop of the trip. 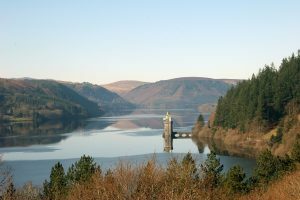 The roads around Lake Vyrnwy were still deserted and we enjoyed feeling like we had Snowdonia all to ourselves. These quiet roads continued all the way to Bala as we rode alongside the Lake where we had taken a dip in the deep, clear waters the previous day. On this road, we saw the welcoming sight of a public toilet sign and pulled into Llyngower station to make the most of the facilities. After topping up the sugar levels with some wagon wheels (cycling is the perfect excuse to enjoy some childhood favorites) and cereal bars we headed off; there was still a long way to go before the first café. Rolling into Betws-y-Coed the illusion that we had the roads to ourselves was quickly shattered. Betws-y-Coed is a haven for lovers of the great outdoors. Fondly named “The Gateway to Snowdonia” the clear blue sky that had emerged from the fog was now attracting walkers, trail runners, mountain bikers and cyclists to flock to the small town. We browsed the shop fronts and eventually found the planned café stop. The Alpine Coffee Shop was packed, but we easily found some comfy seats outside and ordered a feast (after checking how far we had to cycle before the next climb). With 100 miles (160km) to go, we arrived in Bangor and we eagerly searched for our chosen café only to be met with disappointment as we discovered it was closed. It was now late afternoon on a Sunday so cafes and pubs were closing up early, something we had forgotten to account for in our planning (oops). Luckily, along with its quirky independent shops, Bangor also has no shortage of high street chain coffee shops. We opted for a Costa and sat down to enjoy some rest and re-fuelling heading back into the hills for the next leg of the journey. We exited Bangor along an old railway line converted to provide a peaceful bike route. The surface is compacted gravel so perfectly traversable on road bikes. After exiting the bike path we searched for the entrance to the next bike path. This path started out slightly gravelly and descended into something more reminiscent of a mountain bike singletrack. We quickly made the decision to turn back and ride along the road instead wanting to avoid any tumbles or mechanicals at this stage. The next part of the ride was my personal highlight. My legs were tired and very unaccommodating towards the relentless climbs. However, the constant rewards of fabulous views and wide smooth descents kept me pushing on the pedals. Hikers on the surrounding mountains looked like tiny little ants creeping up the peaks. The lakes looked beautifully still and crystal clear. By the time we reached Harlech clouds were creeping across the sky and the sugary treats that had been keeping me going were starting to taste sickly. We had planned to stop later in Barmouth for dinner but it was 7pm and we were both starving for something hot and savory, so we started searching for an open restaurant. In the end, we settled on a Chinese takeaway as we wanted something quick and calorific. After rapidly cleaning our plates, we were off again with our pockets topped up with sweets by the kind owner. The next few hours were a blur. We were both shattered and it was starting to get dark. Taking it in turns to follow the flashing red rear lights we kept on pushing for the next town, Barmouth. Even on a Sunday night, Barmouth seemed to have a bustling nightlife, unlike the deserted Harlech. It was at this point that we realized that 200 miles wasn’t going to happen, so we switched to our shorter back up route and pushed on. After miles of rolling roads, we finally reached The Cross Foxes where we had enjoyed dinner two nights ago. This point marked the start of the final long climb before we could descend down to Dinas Myfawdy and roll back to our cozy bed at the B&B. The climb felt long in the dark without the stunning scenery to pass the time. The 12% gradient sign jumped out from the side of the road in the bright white bike lights. Finally, we made it back to the B&B. It was after midnight but our host had kindly left the doors unlocked for us. We put the bikes away and crept upstairs. Miraculously we both managed to stay conscious long enough to shower and gulp down a marshmallow packed hot chocolate before collapsing in bed. The next day came around and our enthusiastic host listened keenly as we recalled our adventure over breakfast. I think that initially we were both disappointed to have to cut our route short. However, as we looked back over the distance and elevation we had achieved, disappointment soon turned to pride. Going through my route on komoot and picking out my Highlights made me realize just what an amazing adventure we had. The roads of Snowdonia are unforgiving on the legs, however, I’ll be back to challenge the mind and legs again soon because outside is my freedom!